When Kate Fitzgerald's father was murdered, she was left in the power of her uncle, Lord Charlwood. Charlwood plotted to force England's greatest hero into marrying Kate, much to her dismay. As Lady Greystone, Kate was faced with two dilemmas: first that she was in danger of falling in love with her husband and second that she was in danger from vowing to expose her father's murderer. What with the resurgence of interest in Jane Austen, Regency romances are enjoying a renewed popularity. Veteran novelist Wolf (best known for her prehistoric The Reindeer Hunters), turns in her own delightful addition, one that combines sensuality and passion with a spirited first-person narrative. 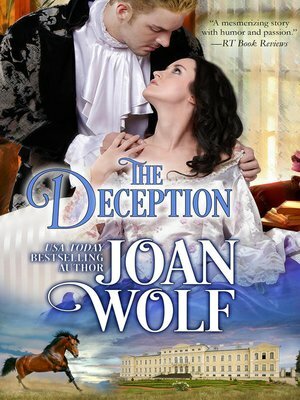 When Kate Fitzgerald's horse-trader father is killed, she's placed with her malicious uncle, who spitefully maneuvers her into marriage with Adrian, Earl of Greystone. Waterloo hero Greystone accepts the unfortunate situation, but Kate falls deeply in love. Against the colorful racetrack background of the running of the Guineas at Newmarket, she schemes to entrap the aristocrat who murdered her father. One caveat: Kate is wonderful, though a bit dense; it takes her forever to realize Adrian cares for her.